I distinctly remember my first introduction to Shelby and her family. Will and I were newly engaged and had just begun attending Sunday morning services at a new-to-us church, when it happened - the slightly awkward interaction that takes place between a middle school student and their unsuspecting teacher outside of school hours. I'm sure I waited patiently through the "shop talk," smiled politely and parted with something along the lines of "it was nice to meet you." But, even then, I knew this time was different - Shelby was special. Several years, one wedding and the birth of our first son later, it struck me that one of the most significant benefits to having a husband who teaches a hundred or so teenagers each year is a vast babysitting pool from which to choose. However, I quickly learned that I am much pickier than Will about these sorts of things, vetoing several other "good students" before it dawned on me - Shelby! She was perfect - a responsible, Christian girl from a wonderful family...and not too boy crazy (trust me, these things are important in a good sitter). We were all a bit spoiled with Shelby...and then the inevitable happened - she left for college. Although I know this is the natural order of things - growing up and heading out into the world - I admit, I grieved her move a bit. Will and I began to schedule our dates around her school calendar, stocking up on nights out when we knew she would be coming home to visit. But, to be honest, I sometimes feel like we book Shelby as much to catch up on what she has been up to in her time away as we do for some time alone. I feel so old when I find myself acting maternal toward people in their twenties (and maybe it's time that I just admit that I am officially old), but I couldn't be more proud of the woman that Shelby has become in the nine years since I first met her. She is such a light to those around her - bravely sharing what God is doing in her life and boldly staking out her place in His plan. I have come to terms with the increasing likelihood that I will never have a daughter of my own. But I do hold out hope that I might be lucky enough to have daughter-in-laws much like Shelby. I know that, someday, she will make some man (and some mother-in-law) very happy. Shelby has been long overdue for a pie and her most recent trip home this past Christmas seemed like the perfect opportunity to bless her for the many ways she has blessed us. But when I thought about what type of pie to make for her, nothing felt just right. So I did what I do when I am absolutely, totally stuck with baker's block - I stalked her Pinterest foodie page...and found three knock-off Somoa cookie recipes. 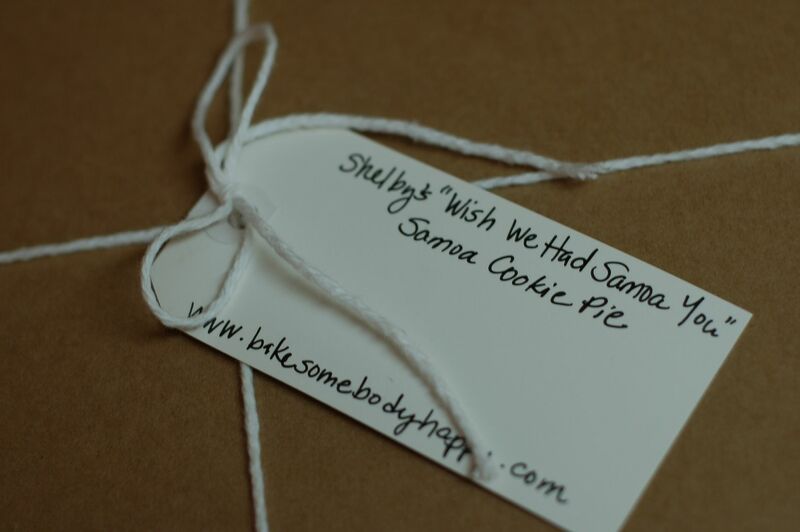 And then it came to me - Shelby's "Wish We Had Samoa You" Samoa Cookie Pie! 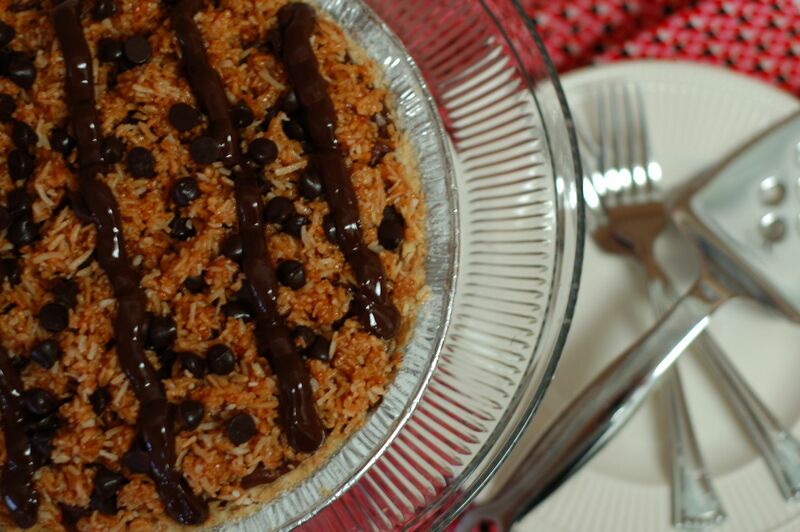 That delicious Girl Scout shortbread cookie, coated in caramel and layered with toasted coconut and fudgy stripes could only get better in pie form. 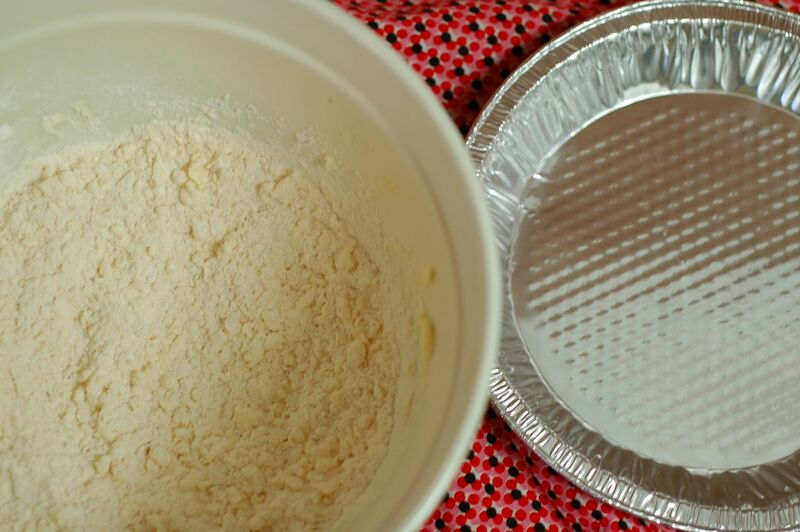 I began with the shortbread cookie crust, adding a generous helping of butter into a bowlful of powdered sugar, flour, cornstarch, vanilla extract and a bit of salt. 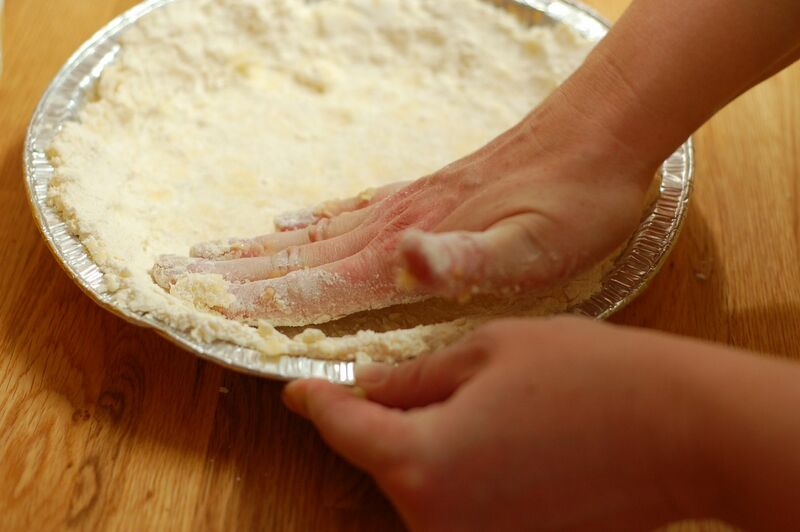 I worked the dough through my fingertips until it held together in large crumbs. 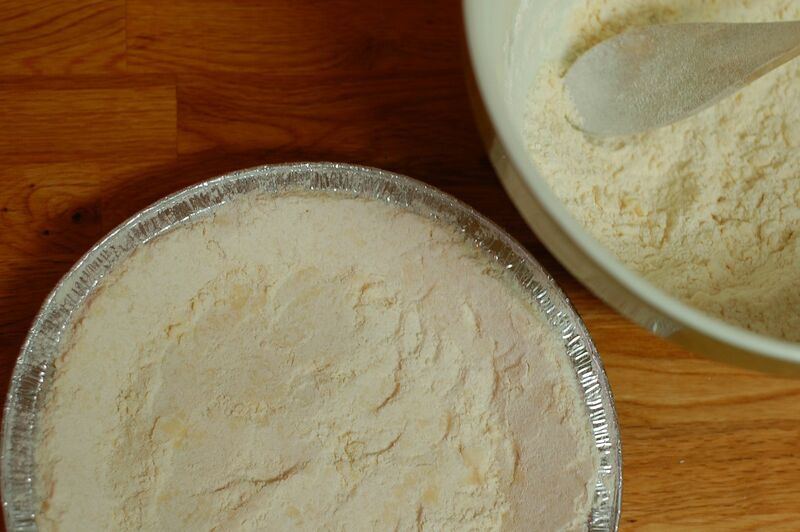 Once combined, I patted the dough into the bottom and up the sides of the pie tin in a uniform layer, pricked the bottom with a fork and placed it into a preheated oven to bake until golden. While the shortbread cookie crust cooled, I set to work on the next layer - the caramel. In previous pie adventures, I had learned how simple (albeit dangerous) homemade caramel could be. So with a little assistance and supervision from my husband, I melted granulated sugar, stirring vigorously with a wooden spoon, until it reached a boil and turned amber in color. Then, I whisked in even more butter and heavy whipping cream until smooth. Once cooled, I slathered a thick, sticky layer of rich, homemade caramel over the entire crust (and failed epically at resisting the urge to lick the spoon). For the next layer - the chocolate coconut custard - I adapted my favorite custard recipe, making minor substitutions here and there and swapping one cup of whole milk for coconut milk. To begin, I melted a combination of unsweetened and bittersweet chocolates in a double boiler before whisking in a pad of butter and a splash of vanilla extract. Meanwhile, I heated a combination of granulated sugar, cornstarch, salt, egg yolks, whole milk and coconut milk in a saucepan over medium heat. Once the filling had come to a boil, I reduced the heat and continued to whisk until it reached a pudding-like consistency. Then I married the cooled, melted chocolate and thick, coconut custard and poured the resulting filling into the caramel-lined crust. 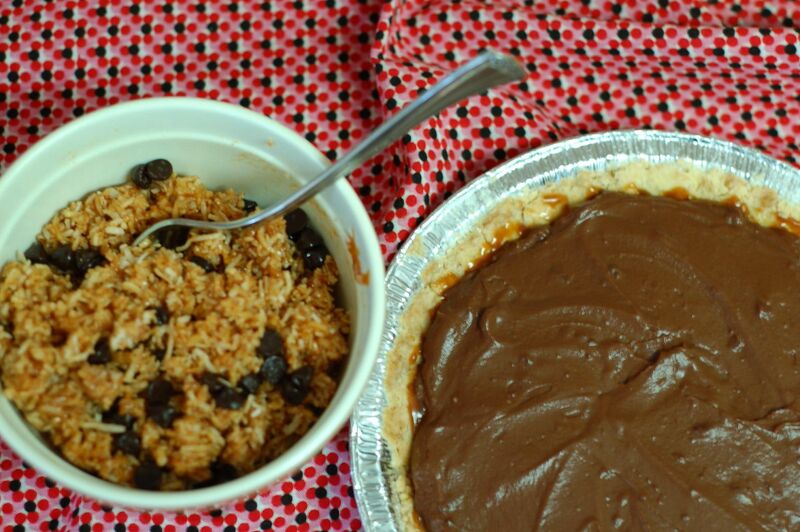 Up next - the final and most important layer in recreating the Samoa cookie in pie form - the coconut-caramel topping. 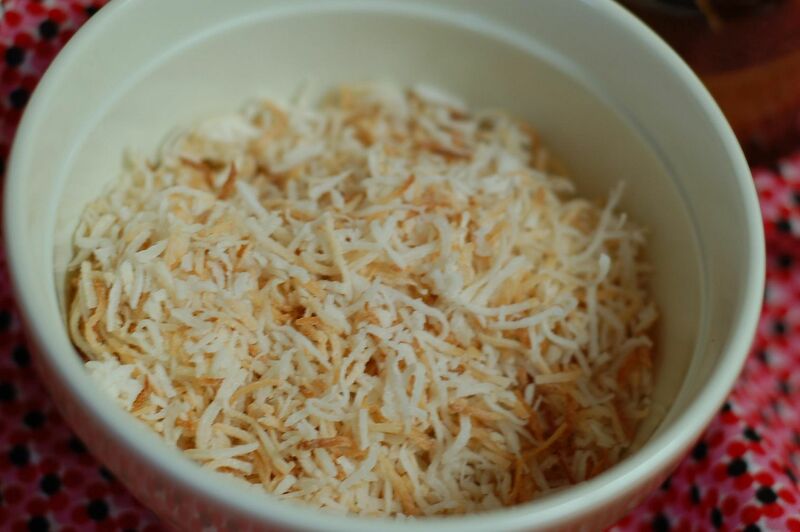 I began by toasting sweetened, shredded coconut in the oven until just golden brown. 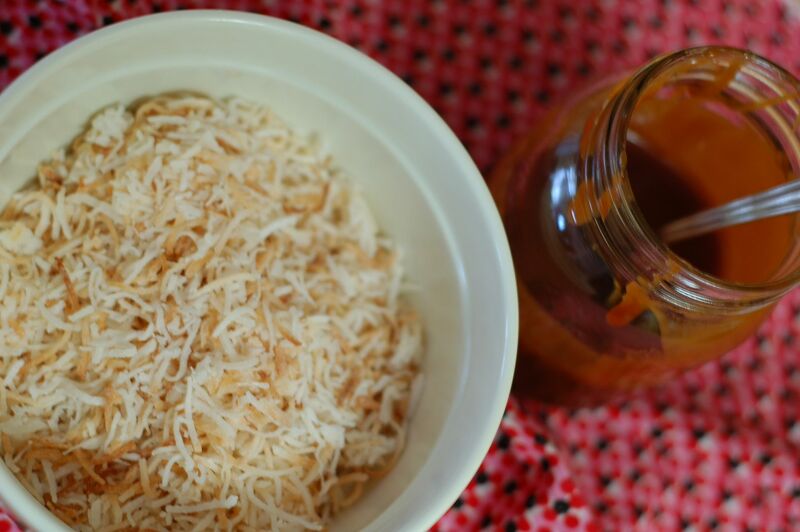 Then I added a spoonful of the homemade caramel to the warm, toasted coconut before sprinkling in a generous handful of dark chocolate chips. 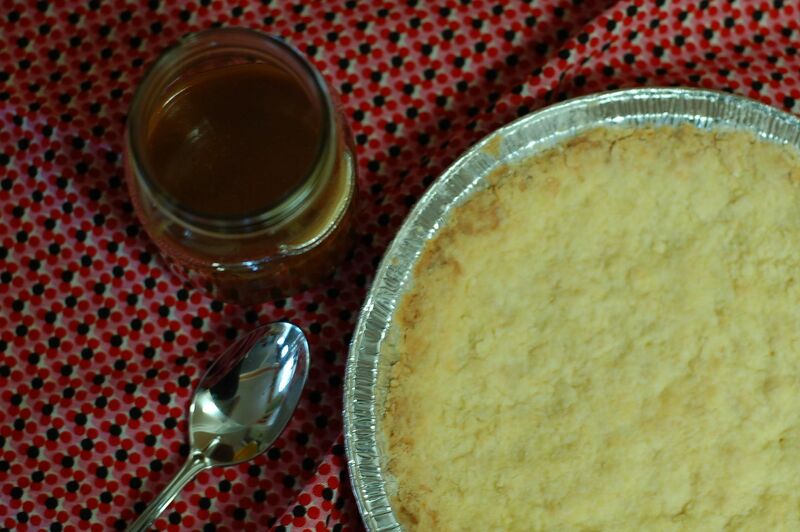 I piled the decadent coconut-caramel crumble high over top of the pie. 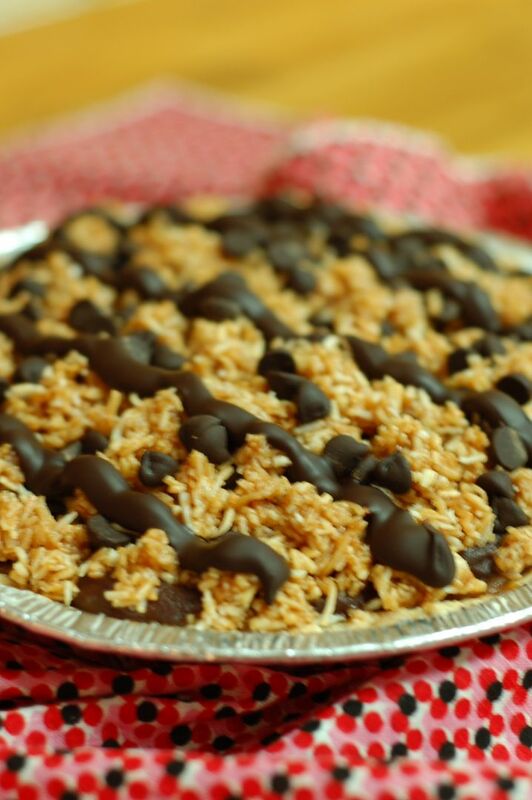 And, in an attempt to recreate the Samoa's trademark fudge stripes, I melted dark chocolate chips to pipe over top. 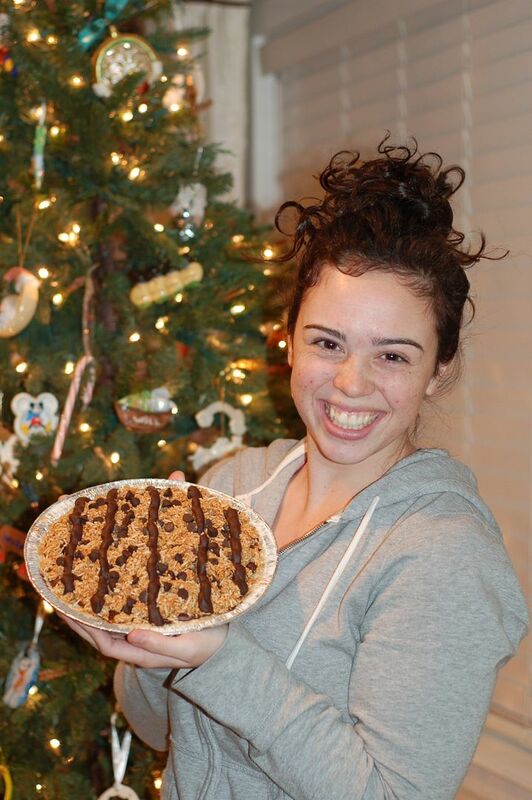 The result was one large cookie - in pie form. I am so thankful that God placed Shelby in our path on that summer morning in church so many years ago. I have had the pleasure of watching her grow from an uncertain middle school student to a confident young woman and friend and I can't wait to see what the next chapter of her life holds. My only hope is that as she ventures out into this great big world, the road she travels will lead her home once in a while...because we sure do wish we had "Samoa" her.